February 10, 2014 Stephanie Law, Psy.D. By now most of us know something about the concept of mindfulness. Well, mindfulness has definitely gone global! It made the cover of Time Magazine in January 2014 in an article entitled: “The Mindful Revolution: The science of finding focus in a stressed-out, multitasking culture.” Reading the article reminded me of the powerful implication of neuroplasticity, something I’ve studied recently, particularly as it bears on my work with patients. Drs. Allan Schore and Daniel Siegel have made the most powerful links between the brain and the mind, and between neuroscience and psychotherapy. According to Dan Siegel (Siegel and Kornfield, 2010), there is clear scientific evidence that tell us specific circuits of the brain can be activated by focusing out attention. In turn, how you activate those specific circuits, under certain conditions, has actually been found to change the underlying structure of the brain. This is called Neuroplasticity. Siegel goes on to state that the focus of attention is the “scalpel that lets you remold the structure of the brain.” Where you focus attention activates the neurons in the particular circuits that correlate with that activity, meaning they fire together. Neurons that fire together, wire together. Focused, careful, massed concentration seems to work the best. If you’re going to do 20 hours of practice, better to do it all during a weekend retreat than over the course of six months. If you’re going to be in psychotherapy, you might want to go twice a day for a month then once a week for a year. Psychoanalysis had it right, Dan Siegel says, because reflective practice can create massed and focused attention on particular areas of oneself. In particular, mindfulness involves the process of paying attention to your body, and then back to your affect, to allowing your mind to wander, catching that, and moving back to the moment. When we follow this flow of activity, it creates an integrated state of neural firing because where you focus your attention creates a state of activation. With the repeated creation of an intentional state of awareness over time, particularly an integrated state of neural firing, the brain changes so that you develop a trait, which is what emerges when the architecture of the brain changes. Those traits are an amazing list of traits, according to Dan Siegel. What you find is that the practice of mindful awareness harnesses the social circuitry of the brain, which overlaps with the regulatory circuitry of the brain. So the traits you begin to experience are stress reduction, improved immune function, enhanced capacity for empathy and compassion, ability to balance one’s emotions, and insight. Siegel also says the following - if you have a psychology that doesn’t have a contemplative dimension, it means you can only be with the active, busy, and engaged mind and there are whole dimensions of your mind and of being human that you’re missing. What research is proving is that we can encourage people to reflectively observe the flow of information, both the busy mind and the contemplative mind, and when this occurs, you can learn to regulate it, and most importantly, modify it. These are wonderful reminders for the work of psychotherapy. Research is proving that the end result is a positive change to one’s emotional, physical and spiritual conditions. Amidst the frenetic pace of most of our lives, it is a good reminder to intentionally create space for reflective and contemplative pausing because to do so is to change the very architecture of our brain! January 27, 2014 Stephanie Law, Psy.D. Jonathan Shedler, in a landmark paper published in the American Psychologist in October of 2009, states that effect sizes for psychodynamic psychotherapy are as large as those reported by other therapies. In fact, he makes a bold statement, “the perception that psychodynamic approaches lack empirical support does not accord with available scientific evidence and may reflect selective dissemination of research findings.” Shedler acknowledges that there may be a lingering distaste in the mental health professions for past psychoanalytic arrogance and authority. In decades past, he says, American psychoanalysis was dominated by a hierarchical medical establishment that denied training to non-MDs and adopted a dismissive posture toward research. This did not win friends and influence people, he writes. When empirical findings emerged that supported non-psychodynamic treatments, many educational establishments greeted this with excitement and were eager to spread the word. When evidence supported psychodynamic concepts and treatments, it was often overlooked. Psychoanalyst Frank Summers provides an interesting discussion on this in his recent book, The Psychoanalytic Vision: The Experiencing Subject, Transcendence, and the Therapeutic Process. He writes, “Psychoanalytic insights into human experience have been attacked as invalidated speculations…” In fact, “psychology texts are unanimous in dismissing psychoanalytic ideas as empirically unverified (Munn et al, 1969; Morgan et al., 1985; Kalat, 2007). Summers goes onto state that the dismissal of analytic theory is not based on research findings but on the fact that psychoanalysis fails to fit into the dominant objectivist ideology of the social science culture. The natural sciences have enjoyed great benefit with the objectivist method and is based on a certain stance. This stance is reflected well by a statement by E.L. Thorndike in 1918: “Whatever exists, exists in some amount, and whatever exists in some amount can be measured.” Summers’ point is that this is a certain concept of reality that tends to believe that only the measurable exits. Hence, psychology texts define the field as the study not of the psyche, but of the behavior of living organisms. An introductory psychology textbook by Morgan et al., 2005, states the following, “Behavior, rather than mind, thoughts, and feelings, is the subject of psychology because it alone can be observed, recorded, and studied.” Summers’ point is this – the application of objectivist space to humans is a theoretical prejudice that ignores the distinctively human quality of being in the world. Psychic states, while one can make attempts to understand and quantify, are difficult to measure. Approaching the complexity of the human being with a purely empirical approach misses so much of the very subject matter in question. With the ACA’s supposed emphasis on outcome measures, and the tying to financial incentives to those outcomes, it’s easy to assume that a psychodynamic sensibility will be squeezed out. Not everything that is, is measurable and if our healthcare system is continually leaning toward legitimizing only that which is measurable, the psychoanalytic worldview becomes countercultural. January 13, 2014 Stephanie Law, Psy.D. Mental health costs are actually a very small portion of total healthcare spending and will continue to grow more slowly than other costs, due in part to the continuing impact of managed behavioral healthcare organizations (MBHO’s). Mental health spending was $33 billion in 1986 and $100 billion in 2003. The total cost of mental illness and substance abuse – including treatment costs, law enforcement costs, mortality, and decreased productivity – has been estimated to be $190 billion per year (NAMI, 2013). With these figures in mind, experts predict the following trends. First of all, mental health spending is projected to reach $203 billion by 2014 but will account for a progressively smaller share of overall health spending, dropping from 7.5% in 1986 to 6.2% in 2003, and to only 5.9% in 2014 (Levit et al., 2008). Secondly, the share of spending for psychologists, counselors, and social workers for 2014 will remain at the 2003 rate of only 8% of all mental health spending, which is down from 9% in 1986. Ironically enough, fees for psychotherapy are only .047% of all healthcare expenditure dollars. Thus, a third trend projected is that spending for mental healthcare provided by physicians will increase from 11% in 1986 to 16% in 2014, with 70% of those services performed by psychiatrists. And finally, it is estimated that prescription medications, which were only 7% of mental health expenditures in 1986, will rise to 30% by 2014. One also cannot discuss national expenditures for mental health services without mentioning how the development and marketing of antidepressant medications has impacted the practice of psychotherapy. From 1998 to 2007, the percentage of individuals in the general population receiving outpatient psychotherapy decreased from 15.9% to 10.5%. There was also a reduction in the percentage receiving a combination of psychotherapy and medication, decreasing from 40% to 32.1% (Olfson & Marcus, 2010). In contrast, the percentage of individuals prescribed medications alone increased from 44.1% to 57.4%. Health insurance plans, which typically cover psychotropic medications while significantly limiting coverage for psychotherapy, have been a major factor contributing to the treatment of larger numbers of individuals with mild to moderate disorders in primary care environments, as compared with specialty care environments (Olfson & Marcus, 2010). This is a fancy way of saying that people now tend to talk to their primary care physician about psychological symptoms or to inquire about psychotropic medication, rather than seek out a psychologist or psychiatrist in private practice. These numbers also suggest that individuals tend to reach for the anti-depressant BEFORE it occurs to them to find a psychotherapist, especially because their insurance company probably covers the visit to the family doctor, rather than a visit to a private practice psychologist. January 6, 2014 Stephanie Law, Psy.D. I’d like to offer a glimpse into the current landscape set before us, and what the Affordable Care Act (ACA), in part, is trying to address. If you’re like me, seeing numbers can be helpful. And despite my fears and hesitations about the ACA, these numbers and figures help me understand some of the rationale behind the ACA and provide some empathy for its attempts to address a serious problem. What about to share are a lot of numbers. Don’t get lost! There is a purpose behind them and if you can stay with them, I think you’ll find yourself more informed. Healthcare Spending in the US reached $2.6 trillion in 2010, which is 17.6% of our gross domestic product (GDP). It’s expected to rise to $4.7 trillion or 19.8% of GDP by 2020. These rising costs are due in part to the impact of major coverage expansions in 2014 and beyond, as a result of the ACA and projected Medicare enrollment growth. By 2020, estimates suggest the government will pay 49% of all healthcare costs (Keehan et al., 2011). In 2009, only 1% of the US population accounted for 63.6% of all healthcare spending. A different half of the population accounted for only 2.9% of all spending (Cohen & Yu, 2012). Due to these numbers, there is a growing awareness that medical and mental-health problems are often linked. Patients with diabetes and heart disease have twice the rate of anxiety and depression as the general population, which in turn makes it harder to make healthy changes like losing weight. Hence, a key to bending this cost curve is development of care systems that target that part of the population accounting for the greatest costs. Here’s another interesting fact, approximately 25% of primary care patients have one or more disorders – mostly anxiety, depression, or substance abuse, according to a recent JAMA study. Time pressed primary care doctors typically hand such patients a referral to a mental health specialist, but only 60% of these patients followed through, according to a 2002 study in Seattle conducted by the University of Washington. In contrast, in an integrated practice, doctors can do a “warm handoff” instead, personally introducing patients to a therapist on site. By integrated, the experts mean a clinic or hospital that houses a wide variety of providers, including ones for mental health. Many studies have shown that integrated care can reduce patients’ depression and cut costs. One University of Washington study of 1,800 patients found that providing a year of integrated care cost $600 a patient but saved an average of $4,000 in lower medical bills over the next four years. It is with this in mind that patient centered medical homes and Accountable Care Organizations (ACO’s) have been piloted and tested for persons with chronic illness, including serious and persistent mental illness (Grumbach & Grundy, 2010) A perfect example of an ACO is the Kaiser Hospital system here in California, which is a group of hospitals, physicians, and other providers who share responsibility for the cost and quality of care for a defined patient population. What experts seem to be saying is that significant savings are possible but ACO’s require intensive collaboration and investment to support care management and exchange of sensitive performance data. What are being included in these ACO’s are psychologists and mental health clinicians. However, one has to keep in mind that the kind of work psychologists are doing in ACO’s is very different than the work done in private practice offices. Psychologists who work in the ACO setting are doing important work but the pace is frenetic, sessions typically last 15 to 20 minutes, and group therapy is common. Patients are commonly seen only 3 – 5 times and provided problem solving skills, relaxation techniques, or psycho-education. As you can see, there is a tension represented here. An ACO’s design is attempting to target more patients who have psychological issues because to do so will actually result in more savings over the long haul. And if more people are going to be insured, because of the ACO, then you can see why hospitals want to include more psychologists in house. However, like I just mentioned, the kind of treatment provided in the hospital is of a very different kind than provided in the private practice model. 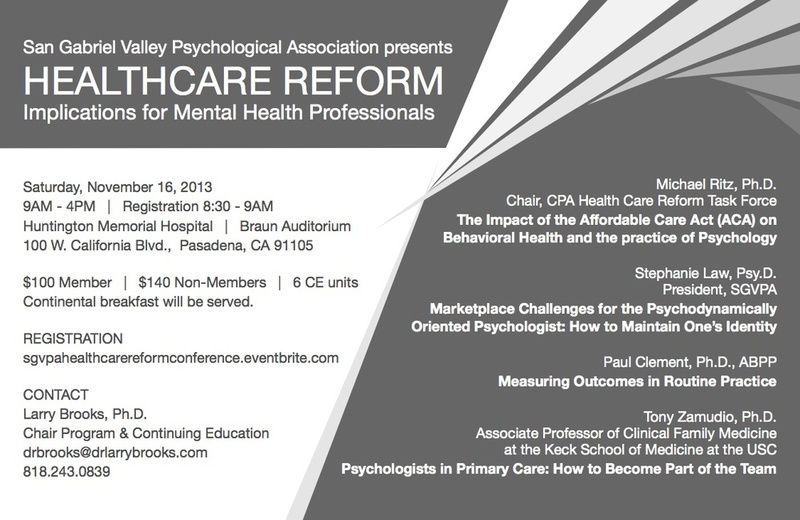 November 17, 2013 Stephanie Law, Psy.D. For a brief, but effective look at encouraging psychotherapy, feel free to view the following short videoclip! October 22, 2013 Stephanie Law, Psy.D. I’ve been reflecting much on death and dying recently. I seem to have encountered the concept frequently via personal and professional contacts. A couple of months ago, I was given the opportunity to say goodbye to a beloved professor from my doctorate program. After fighting metastasized cancer for 14 years, this woman was officially given two to three weeks to live. Along with approximately 40 other students from my program, I was given the honor of sitting in her presence for two hours, expressing to her my deep gratitude for her life and love. It was one of the most moving experiences of my life. Despite the fact that this woman has been “dying” for 14 years, she’s one of the most “alive” human beings I’ve ever known. Rich in psychological depth and spiritual understanding, this lady has changed the lives of many. I’ve pondered the lessons this woman’s life and death may have for me. I don’t believe there’s any topic more anxiety ridden than the idea of death or loss. In fact, the basic premise of Ernest Becker, in The Denial of Death, is that human civilization is ultimately an elaborate, symbolic defense mechanism against the knowledge of our mortality. One need only turn on the television for a few minutes before encountering various topics promising some form of elongated life. Multivitamins, face cream that stops aging, and plastic surgery, to just name a few. We humans seem to struggle mightily with the idea of death, of loss, of terminations, or of endings. We balk at them and cry at them. We avoid them, but then we dream about them. Depending on the type of death (or loss), we may become depressed, overwhelmed, avoidant, or fearful. We also might fight bitterness, anger, and loathing, as a result of the loss we’ve been dealt. I don’t think that it’s ever too soon to think about the meaning of one’s life. Sitting with death, deeply and honestly, has a way of focusing our energies and cleaning our senses. It invites us to think about our relationships, how we spend our time, and how we treat others. Each of you is doing something with your life. Whether it’s buying groceries, sipping coffee, or spending time with those whom you love, I urge you to do it wholeheartedly and with great kindness, knowing that you’re engaging in life, encouraging others to live more fully, and changing the world in the process. September 9, 2013 Stephanie Law, Psy.D. Happy people don’t hide from emotions but instead tend to acknowledge that life is full of disappointments and are willing to address them. Feelings of anger can be effectively utilized to stand up for oneself or in becoming more assertive. Feelings of guilt can be used to motivate oneself toward behavioral change. This mental flexibility between pleasure and pain, the ability to shift one’s behavior to match a situation, is known as psychological flexibility and results in greater wellbeing! Columbia University psychologist George Bonnano found that in the aftermath of 9/11, the most psychologically flexible people living in New York City during the attacks bounced back more quickly than their less adaptable counterparts. Specifically, Dr. Bonnano found that those individuals who were angry at times but could also conceal their emotions when necessary enjoyed greater psychological and physical health in the months and years after 9/11. Opportunities for flexible responding are frequent. Perhaps a colleague appeared rude and demeaning. Instead of letting your hurt and anger simmer quietly, accept your feelings as a signal, which allows you to employ other strategies for reacting. These include compassion. Perhaps the colleague is experiencing an emotionally difficult time. Another strategy includes mindful listening – being curious about what might be occurring in the life of this colleague that has nothing to do with you. Similar to training for a marathon, learning the skill of emotional discomfort is a task that’s learned over time. So instead of pouring yourself a glass of wine next time you get into an argument with your spouse or family member, try simply tolerating the emotion for a few minutes. Before you know it, your ability to tolerate daily negative emotions will expand. August 12, 2013 Stephanie Law, Psy.D. It’s easy to assume that when we encounter difficulties, it’s the presence and empathy of a good friend that assists one in journeying through the pain. Whether we get passed up for a promotion, find ourselves in conflict with a family member, or encounter a loss of some sort, it’s the presence of a good friend, or of benevolent social support, during those times that makes all the difference in the world, right? Interestingly enough, recent research from psychologist, Shelly Gable (USC in Santa Barbara), has found that the happiest people are the ones who are present when things go right for others – and whose joys and wins are regularly celebrated by friends, as well. Dr. Gable also found that when romantic partners did not make a big deal out of each other’s successes, the couple is more likely to break up. As it turns out, when couples celebrate each other’s accomplishments, they’re more likely to be satisfied and committed to their relationship. But aside from intimate relationships, why would it be conducive to be genuinely happy for a friend’s success, even in an area in which you yourself may struggle? (For example, your friend gets the promotion after you’ve been turned down numerous times!) The process of discussing positive events with a responsive listener actually changes the memory of the event. So after telling you about it, your friend will recall that night as even more positive that it was. And more importantly, the next time your friend encounters a difficulty, he/she will recall your positive support. So while it may be kind to send a card to your friend when he/she was dumped, you’ll both achieve more satisfaction out of the flowers you send her when she gets that promotion or when he graduates with his medical degree. Happier people are those individuals who actively celebrate others’ successes. August 5, 2013 Stephanie Law, Psy.D. Research appears to suggest that satisfied people are less likely to be analytical and detail-oriented! University of New South Wales psychologist, Joseph Forgas, found that happy people tend to be less skeptical than others, uncritically open toward strangers, and can be vulnerable to lies and deceit. When negotiating the finer points of a complicated and social world of colleagues, dates, and friends, it certainly seems adaptable, and even advisable, to pay attention to the finer details. Yet, research seems to suggest that too much attention to detail can interfere with basic daily functioning. Psychologist Karen Harkness, from Queen’s University, found that individuals in a depressed mood were more likely to notice minute changes in facial expressions. Meanwhile, happy people tended to overlook these small changes in others’ faces. A flash of annoyance, a sarcastic grin, a rising of the eyebrow – were all fluctuations that happy people seemed to overlook more easily. While in a bad mood, we tend to notice the tiniest shifts and can’t seem to disengage from an argument. The happiest people seem to have a natural protection against getting sucked in by the pull of those little details. For example, a nice analogy might be the effect of water on a duck – it slides right off! Another way to put it, perhaps, is “not sweating the small stuff.” Don’t get me wrong, paying attention to details is helpful, but too much focus on minutiae can be exhausting and debilitating. The happiest people accept that striving for perfection is a loser’s bet and are willing to let small offenses go by the wayside. July 29, 2013 Stephanie Law, Psy.D. “Truly happy people seem to have an intuitive grasp of the fact that sustained happiness is not just about doing things that you like. It also requires growth and adventuring beyond the boundaries of your comfort zone.” (Kashdan & Diener, Psychology Today, Aug 2013) Simply put, happy people are curious. In a 2007 study done by Kashdan and Michael Steger, participants were monitored for 21 days on their daily activities and how they felt. Those who felt curious on any given day also felt the most satisfaction and engaged in happiness-inducing activities. Interestingly enough, curiosity is at its base an anxious state. It’s a state of not knowing and is largely about exploration. Studies seem to suggest that curious people accept the notion that while being uncomfortable and vulnerable is not an easy path, it can also provide a means of becoming stronger and wiser. In fact, the study performed by Kashdan and Steger suggests that curious people invest in activities that cause them discomfort but the result is often a higher psychological peak. So, from time to time, it seems that it’s worth engaging in an experience that is novel, intricate, uncertain, and even upsetting. July 23, 2013 Stephanie Law, Psy.D. In an article in the August submission of Psychology Today, authors Kashdan and Biswas-Diener attempt to tackle the question of happiness. Interestingly enough, the question of happiness is not uniquely an American ideology. Psychologists Ed Diener of the University of Illinois at Urbana and Shigehiro Oishi of the University of Virginia studied more than 10,000 participants from 48 countries. They discovered that individuals from all over the world rated happiness as being more important than other personal outcomes, such as having meaning in life, becoming rich, and getting into heaven. The article mentions that true happiness is probably better described as a sense of peace or contentment. It also includes cognitive reflections, a state of mind, and as such, can be intentional and strategic. And not surprisingly, certain choices you make throughout the day can push you toward increased well-being – or not. Happy people, it turns out, engage in some counterintuitive habits that seem downright unhappy! So stay tuned for a collection of findings that researchers have found increase a sense of well-being! July 18, 2013 Stephanie Law, Psy.D. June 25, 2013 Stephanie Law, Psy.D. In the world of addiction treatment, substance abuse is currently most often understood and defined using a psychomedical model. People must possess a set of characteristics to be diagnosed as an addict, which includes excessive alcohol or substance consumption, increased tolerance of the substance, withdrawal symptoms if he/she does intake the substance, and sometimes serious health issues related to the drug use. However, it’s important to keep in mind that addiction is different than substance abuse. The latter is simply the misuse of a drug and can occur intermittently throughout one’s life. For the former, the individual must display a consistent pattern of abuse over a longer period of time. Additionally, there are many different ways that experts understand and describe addiction. The three most common theories out there are that it’s a moral failing, that it’s a disease, or that it’s a behavioral disorder. Taite and Schartt, in “Ending Addiction for Good” (2013) argue that addiction should be considered a behavioral disorder and that treatment should focus not on whether addiction is present because of a “disease” or because of "genetic predisposition." The pain of addict’s lives, not genetics, is what can be seen as the root of addictive behavior. Likewise, there are usually triggers that have tipped the addict over the edge and that trigger is almost always trauma or profound neglect. The benefit to emphasizing the behavioral model of addiction allows providers and patients to consider a broader range of treatment options. The addict can absolutely change behaviors and return to normal living. Another point that Taite and Schartt make is that the behavioral model of addiction encourages addicts to reflect on the events that happened in his/her life that may have contributed to the addiction. They argue that this in-depth work is necessary for lasting, long-term change. They also make the point that the emphasis on biological components to addiction can actually be a defense against exploring the trauma and deeper pain in one’s life that likely is more of the root cause. The use of drugs, to the point of addiction, is usually the individual’s way of coping with pain. The drug allows the addict to withdraw from reality and avoid his/her core issues. The drug’s effects cover the pain of trauma. When the drug wears off, it must be taken again. This cycle continues to the point of habituated activity in the addict’s life. Take away the drug and the pain of the original trauma comes rising to the surface. This self-defeating, self-sabotaging behavior is what addiction is really about. May 12, 2013 Stephanie Law, Psy.D. Dr. Jean Twenge and colleagues in the San Diego State University psychology department analyzed mental health records collected between 1938 and 2007 from more than 63,000 young adults. They discovered a dramatic and significant increase in psychological problems, particularly depression. In fact, they concluded that students today feel much more isolated, misunderstood and emotionally sensitive and unstable than in previous decades. Teens today are more likely to be narcissistic, have poor self-control and to endorse general overall dissatisfaction with life. Twenge and her colleagues concluded that consumerism is a major reason for the rise in mental illness. Twenge is quoted as saying “We have become a culture that focuses on material things and less on relationships” (Jethani, 2011). While one might have more questions about all the details of this study, it is certainly worth nothing that the rise in depression coincides with the rise in consumerism along with the individualistic nature of America’s society. Implicit in Twenge’s findings is the importance of relationship. A plethora of research confirms the importance of connectedness. Those who are embedded in communities, even if they suffer mental illness, will have a greater chance of healing and of shouldering their pain with dignity. Psychotherapy offers the opportunity to be known, fully known, and still accepted, which is something the human being seems to crave. It is in the context of deep vulnerability AND acceptance that we humans thrive, find meaning, and live life more fully. Did Abe Lincoln Suffer from Bipolar? April 29, 2013 Stephanie Law, Psy.D. No – at least according to award winning author, Doris Kearns Goodwin, in “Team of Rivals: the Political Genius of Abraham Lincoln.” However, it does appear that Lincoln experienced periods of depression and manifested a melancholy temperament. In January of 1841, in particular, Lincoln experienced a vortex of events, resulting in one of the lowest periods of his life. He had just experienced his broken engagement with Mary Todd, the woman who eventually became his wife. Two additional events caused Lincoln great pain – his political life seemed at a stalemate and his best friend moved away. What resulted was a period of Lincoln’s life that historians indicate included suicidal ideation and a marked withdrawal from his social life. Letters from that period even state that friends “had to remove razors from his room.” Interestingly enough, Lincoln sought treatment, consulting not only a Dr. Henry, but also Dr. Daniel Drake, a doctor at the medical college in Cincinnati. Lincoln eventually recovered from this very dark period of his life, in part, by monthly visits to see the best friend that had moved away. Author Goodwin goes on to delineate the difference between melancholy and depression. “To be sure, Lincoln was a melancholy man…this melancholy was stamped on him…it was part of his nature and could no more be shaken off than he could part with his brains.” Goodwin states that Lincoln’s melancholy partially indicated a withdrawal to the solitude of thought. As a child, he retreated from others to read. As an adult, he worked through a problem in private. It is Goodwin’s intimation that others frequently perceived this as evidence of melancholy. Also, the contours of Lincoln’s face, when relaxed, seemed to hint a sorrowful aspect. According to Goodwin’s thinking, there is a difference between depression and melancholy, the latter not having a specific cause. Rather, it is an aspect of temperament, of one’s nature. “Melancholy is a far richer and more complex ailment than simple depression. There is a generous amplitude of possibility, chances for productive behavior…” The melancholy that Lincoln seemed to exude “derived from an acute sensitivity to the pains and injustices he perceived in the world. He was uncommonly tenderhearted.” Goodwin argues that Lincoln possessed a profound capacity for empathy and for compassion, making him predisposed to sorrow but also profoundly capable of understanding his colleagues and the people he served as President. And another thing, Lincoln was “extraordinarily funny.“ “Lincoln himself recognized that humor was an essential aspect of his temperament. He laughed, he explained, so he did not weep.” His stories were intended to “whistle off sadness.” So did Lincoln manifest symptoms of bipolar? No, not as far as the history books seem to intimate. Did he experience a profound sensitivity to the events and people around him? Yes, and Goodwin seems to state it was what made him one of the best presidents our nation has ever known. April 11, 2013 Stephanie Law, Psy.D. Those diagnosed with Bipolar Disorder experience an array of various symptoms and can often feel confused about what contributes to the waxing and waning of the disease. Most professionals thinks of the cycling of bipolar disorder as reflecting a complex interplay among genetic vulnerability, biological agents, psychological agents, and stress factors (Miklowitz, 2011). By genetic vulnerability, experts mean to imply that there is an inherited aspect to this disease. If you have family members diagnosed with Bipolar, you’ll likely have the propensity yourself. By biological agents, experts mean that there is actual abnormal functioning of brain circuits involving neurotransmitters, such as dopamine. And then there are psychological agents, meaning the internal psychological underpinnings of your self, how you perceive yourself and the world, and your internal beliefs. Finally, the stress agents that the literature points to involve the environmental factors occurring in one’s surroundings that may add stress. Therefore, we do not need to think of bipolar disorders as either a brain disease or only as a psychological problem. It’s more complicated than that and usually entails various contributory causes. April 6, 2013 Stephanie Law, Psy.D. The physician who spent much of his life working with lepers in India was a gentleman by the name of Dr. Brand. He discovered that leprosy destroys the nerve endings in the body, leaving lepers unable to to feel. While this fact might seem like a blessing, it is ultimately a curse, resulting in the loss of limbs and even death. Without pain, lepers are unaware they have been injured. Dr. Brand is quoted as saying, "I thank God for pain, I cannot think of a greater gift I could give my leprosy patients." Symbolically speaking, the avoidance of pain can make us emotional lepers - we become incapable of experiencing the aches, pains, and fears of our existence, as well as the joys, the beauties, and freedoms of our lives. Although no one enjoys feeling pain or fear, these emotions play an important role in our existence. They help us stay alive! March 12, 2013 Stephanie Law, Psy.D. February 17, 2013 Stephanie Law, Psy.D. December 11, 2012 Stephanie Law, Psy.D. For a pretty thorough discussion on the importance of resilience when dealing with PTSD, go to the following link.